NOTICE: This app is deprecated. Please use the Twitter Neo4j Sandbox instead: https://neo4j.com/sandbox. Graph your Twitter activity in Neo4j! The Graph model we use to load your data. Use the Browser to Explore your Graph. We're now loading your Tweets from the Twitter API as well as a mixture of other tweets which may be popular to Graph Database enthusiasts. Note that the Twitter API has quotas which mean your Tweets have to be loaded over time, depending on how much Twitter activity you have. 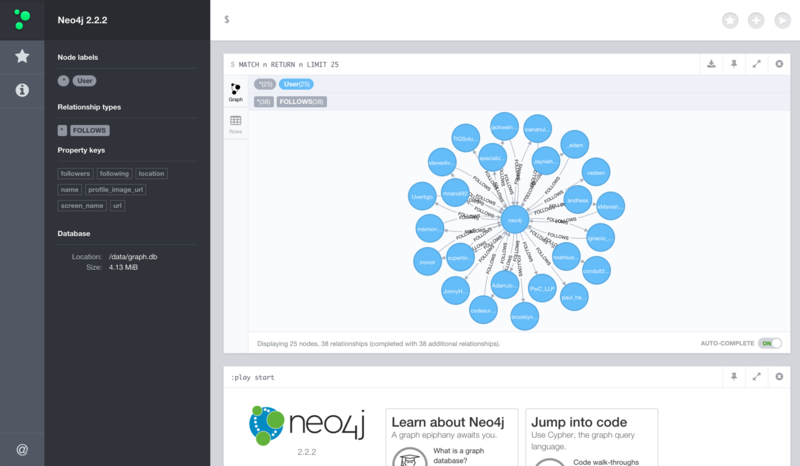 Access your personal instance of Neo4j using the URL, username, and password above. We'll keep your instance around for a few days, but you can always come back and get a new instance. Try these queries in the Browser yourself to explore your data. Until all your data is fully loaded, results may not be accurate. How long does my Neo4j instance last? We keep your instance alive for about 3 days. After that, you'll get a new instance when you login.